The Times Higher Education World Academic Summit begins today in Singapore, including the launch tomorrow night of the World University Rankings 2019. But how should we value a university education? Discussion about proposed changes to the pathway to legal practice in Singapore has tended to focus on whether this will make it harder to become a lawyer. “They are literally raising the bar!” quipped one wag. But a central recommendation is to separate a legal education from legal practice. At present, there are graduates who fight to get a six-month training contract only so that they can be called to the bar. They then go on to become businesspeople, entrepreneurs, artists, and so on. Such students who only want the education — and the credential — will be able to complete a more rigorous bar exam and get on with their lives. For those who really do want to practise law, the new regime should make it a little easier to get a training contract, while also ensuring that this period (extended from six to twelve months beginning in 2023) better prepares them for a life in the law. At a deeper level, this change acknowledges a profound ambivalence in the purpose of universities and how we think of our students. Are universities the means by which a society produces employees to fulfil specific roles in the economy? Or should we cater to the needs and desires of individual students (and their parents)? Put more simply, are students products? Or are they customers? 3 The Student as Client? The comparison of universities to factories is often traced to educational reforms in Britain under Margaret Thatcher. The 1985 Jarratt Report proposed that universities be run more like businesses, with vice chancellors identified as chief executive officers and reporting on key performance indicators. But the metaphor of students as products is far older than that. During and after World War II, for example, US forces toyed with the idea of using higher education to instil a desire for democracy in the German population. The prototype’s codename was the “Idea Factory”, as Ming Tan (my wife) wrote in her doctoral thesis. At its heart, this view of universities builds on still earlier conceptions of education — now largely discredited — as the filling of empty vessels. That metaphor dates all the way back to Aristotle, but few would defend it today, at least with regard to universities. Nevertheless, institutions of higher learning are routinely said to provide a “pipeline of talent” — implying that our students are some kind of natural resource, to be refined and channelled as needed. This might make sense as a way of thinking about how to allocate funding and structure incentives at the national level; it should not normally be how a professor thinks of his or her students. I do have a T-shirt from my own student days that proclaims “I am a piece of value-added human capital” — though this was meant to be ironic. For the most part, the student-as-product is invoked as a critique of higher education, not a model. 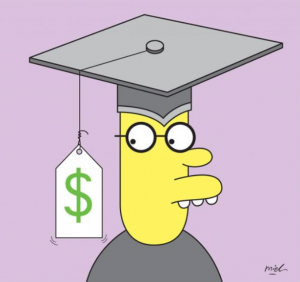 Such critiques often stress the financial pressures facing many universities. As access to and the desire for higher education expanded, a greater proportion of that cost was transferred to students. The result is that they are now referred to as customers or consumers. This is most prevalent, it seems, in the United States, where education is a US$1.5 trillion industry. Yet such language also has older roots. Indeed, it goes back to the earliest universities in Europe. The very first, Bologna, initially consisted only of students, with teachers being hired on an annual basis as the students deemed them necessary. The metaphor of the customer is a healthy one if it encourages students to seek value for money and academics to provide that value. Such a view increases the agency of the student, but also subtly redefines education as a private rather than a public good. There are many problems with such an approach, however, not least the manner in which it drives universities (and deans) to obsess over rankings that will impress potential students and faculty. As Singapore’s International Academic Advisory Panel (IAAP) warned in its report last June, such rankings can imply that there is only one correct model of a university — a fundamental misconception about tertiary education. It also distorts the teacher-student relationship, suggesting that it is transactional: I have something (knowledge, wisdom, perhaps) that you are paying me to transfer to you. There are, to be sure, some students like this. Indeed, executive programmes targeting professionals occasionally adopt the language themselves. Yet studies have shown that greater identification as a “customer” correlates with poorer performance as a student. Like the student-as-product metaphor, it connotes a passivity on the part of the student — recipient of whatever the university has to “deliver”. Such an image is at odds with the active and engaged individual envisaged by most institutions of higher learning. The fashion in certain parts of academe is now to see our students as “clients”. The intention, it seems, is to draw an analogy with other professions that serve clients — lawyers, for example. A client has more invested in his or her relationship with a professor than a customer. Yet it still implies a relationship of service, and a degree of individualisation that may be unrealistic. A study of business students themselves found greater identification with the metaphor of students as “co-producers” or “junior partners”. These labels have the benefit of emphasising the joint enterprise that is university education without eliding the role of the professor as a kind of guide and mentor. In many ways, it is a modernised version of a far older and quite literal description of the younger person being educated into a profession: an apprentice. “Apprenticeship” is particularly applicable to doctoral studies, which provide training for future generations of academics — and is vastly preferable to the alternatives sometimes bandied about, such as “disciple” or “slave”. The use of these various metaphors is of more than linguistic significance. How you think of students shapes policy choices by governments, where and what students actually choose to study, and how my colleagues and I teach. The problem with all such metaphors is that they presume to do something impossible: describe students with a single term. Each student is different and each student’s journey is different. Indeed, that is the point of a university. A hint lies in the name itself, which comes from the Latin unus versus: “turned into one”. The institution itself is a whole, but it is made up of diverse individuals: faculty, students, and alumni existing as a single community. At different points our students might see themselves as customer or client, partner or apprentice. As we open our campuses to more lifelong learners, in any given classroom there will be students seeking very different forms of value — and contributing in their own way to create a richer experience for all. The idea that a university is a place you go to “get” a degree will, in time, be replaced by an understanding that none of us ever stop learning and changing. The constant is that the mission of a university should be transformative. Our graduates should emerge with skills, but also ideas and values. The best will be creative in a way that computers cannot match. And, with luck, they will return to upskill and also share their own knowledge in our classrooms. So, for my own part, I worry less about what students are and more about helping them work out what they will become. Then let them choose their own metaphors. Simon Chesterman is Dean and Professor of the National University of Singapore Faculty of Law. A version of this essay appeared in the Straits Times on 25 September 2018. A full version is available free on SSRN.com here.